When Kelly Baer started taking a business entrepreneurship class, she never expected that in four months she would be teaching college students in another country about the nuances of social businesses around the world. The Indiana State University student also could not have expected that she would receive a grant to do it. Baer was among two groups of Indiana State students and a professor who collaborated with a college affiliated with Bangalore University in Bangalore, India, as part of an international conference on social entrepreneurship and sustainable development in emerging economies. Aruna Chandra, professor of management at Indiana State, was invited to serve on the college's advisory board to help organize the conference and to present her research on social businesses, which are mission driven organizations that create social value in response to pressing social problems. Unlike a non-profit venture, they are profitable, but not profit-driven. Two groups of her students, including Baer, volunteered to work on different initiatives for the conference. They received grants from the Center for Student Research and Creativity to participate in the project. "It made the effort well worth it," said Baer, a senior management major from Jasper. "Even though it was a ton of work, I kept reminding myself that it was actually going to be presented at a real-life conference, and it helped that we were going to get funding for it in the end, too." Baer's group compared social businesses in the U.S., Brazil and India to compare and contrast social ventures in different country contexts and to provide an international perspective on their approaches. They wrote a 10-page paper and created a 60-minute PowerPoint presentation that was recorded and presented to college students in Bangalore during the conference. "This gives my students exposure to social businesses in country contexts very different from ours," Chandra said. "They are comparing and contrasting various elements of these businesses and in the process are learning how social ventures play out in very different cultural and economic contexts around the world." Another group of students collaborating with Malleswaram Ladies' Association First Grade College for Women worked on marketing the conference. They created a double-sided, single-page brochure to that could be sent to perspective attendees - prior to that, information was sent in a nine-page booklet - and created a Facebook page and social media presence for the conference dedicated to teaching people more about the different kinds of social businesses that exist. "When you first think of a social business, you always think of nonprofits, and the money that they get is given by the government through grants, when really you can create a social entrepreneurship company that is for-profit," Baer said. The businesses they researched "created their company to make a profit, but yet make society a better place, which is actually something I'm really interested in for a future career." The Indiana State students even researched U.S. universities with entrepreneurial programs of study, and sent them information about the conference. The students also critiqued the college's website for the conference, which had several issues including broken links. "It was actually a more hands-on approach to class than your normal ‘just read the textbook and you'll be tested over key terms' and stuff like that," said Caleb Ross, a senior business management major from Lizton who was part of the group of Indiana State students that worked on marketing the conference. "It was more like you actually teach yourself and that's really cool. I actually really enjoyed it." The students spent close to 60 hours on the research for the written report and presentation, Baer said. The projects required more work than most in-class research projects, which is why the students applied for the research grants with help from the professor. These kinds of conference presentation research projects are rare for undergraduate students, Chandra said. "I thought they did a very good job with the presentation," the professor added. "They spent a number of hours doing the research, writing the paper and practicing the presentation. They also learned that research is very rigorous and time consuming, demanding and challenging. It's not something that you just sit down and do in a matter of a few hours." 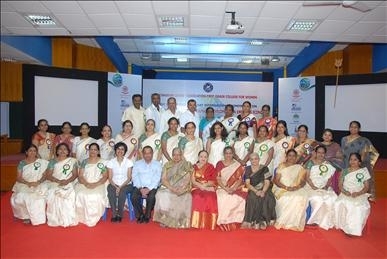 Malleswaram Ladies' Association First Grade College for Women is a college run mostly by women to provide higher education opportunities for socially and economically disadvantaged women in India, Chandra said. The college, which receives donations to support its mission, is an all-commerce college to train students "in different areas of business so they can go out and get a job and earn a living," Chandra added. Social businesses in hardship economies, such as India engage in necessity driven innovation or frugal innovation, which can offer many lessons to entrepreneurs around the world, Chandra said. "I am always struck by the creativity and ingenuity of entrepreneurs who work in resource poor environments, such as this," she added. "They do so much with so little, and they have an entrepreneurial fire in them that is very infectious," Chandra said, "and I think it's very good to expose our students, particularly business students, to that spirit." Photo: http://isuphoto.smugmug.com/Other/Media-Services/Bangalore-Conference-2012/i-JSqpPGR/0/L/Bangalore%20Conf%202012_2-L.jpg (Submitted photo)Indiana State University professor Aruna Chandra, right, at the Three Day International Conference on Social Entrepreneurship for Sustainable Development in Emerging Economies in Bangalore, India. Chandra and several groups of Indiana State business students helped with different aspects of the international conference. Photo: http://isuphoto.smugmug.com/Other/Media-Services/Bangalore-Conference-2012/i-vsrfCTh/0/L/Bangalore%20Conf%202012_1-L.jpg (Submitted photo)Participants of the Three Day International Conference on Social Entrepreneurship for Sustainable Development in Emerging Economies in Bangalore, India. Two groups of ISU students and a professor collaborated with a college affiliated with Bangalore University in India as part of an international conference on social entrepreneurship and sustainable development in emerging economies.